The Nokia EOS has leaked out extensively last week and one peculiar feature in the camera superphone is its use of a mechanical shutter. Why is it there, though? Nokia’s former camera guru Damian Dinning is probably the best person to answer that question and his recent comment makes it all very clear - it’s because of xenon flash. 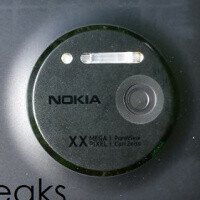 The rumored 41-megapixel camera on the Nokia EOS uses the more powerful xenon flash rather than the LED flash most other smartphones employ. But unlike LED, Xenon actually fires a very short light beam of the equivalent of shutter speeds as low as 1/25,000. In electronic shutters, though, pixels have to shut down all at the same time and this simply happens at a lower speed than the flash which would cause issues with the image - some pixels could just remain black. Hi everyone, there are so few factually correct statements in the original piece or related comments (no disrespect intended) I felt compelled to help explain. Please note, my comments are ONLY addressing the general topic of mechanical shutters – no more. Keeping it simple, the main reason for fitting mechanical shutters is for use with xenon flash. Typically CMOS sensors read light across the sensor from left to right and top to bottom. The time each pixel is ‘read’ is the effective shutter speed. This is OK in most cases and OK with LED flash as the light is effectively constant/continuous. LED flash in most cases being the equivalent of turning on a torch before the exposure and turning it off after the exposure has been made, effectively increasing the amount of light in the scene more or less for the duration of the picture. In the case of xenon, the flash fires a very short ‘pulse’ of light. This pulse can be as short as approximately 1/25,000 (hence why xenon can freeze high speed movement). With a typical CMOS sensor the time difference between the 1st pixel being ‘read’ and the last is greater than this time. The result would be some pixels would be correctly exposed whilst others would be dark or even potentially black. To overcome this, the pixels are effectively read all at the same time. But to achieve this all pixels are turned on, the shutter opens, the flash fires, the shutter closes and the pixels turned off. And that’s why typically mechanical shutters have been needed in products such as n8, n82, n808. In some cases some latest generation sensors can read all their pixels at very high speed (note: again don’t ask me to comment on speculation or rumour) allowing xenon to be used. In some cases e.g. Nikon 1 series these later generation sensors are allowing for electronic shutters which can provide potential advantages in high frame rate scenarios which mechanical shutters would not be suitable for. In some cases a hybrid approach maybe used e.g. a SE product of a few years back which featured xenon only used the mechanical shutter for flash but not other situations, which meant in that case it didn’t provide the following potential advantage…. With mechanical shutters, because the pixels are effectively read all at the same time it overcomes the motion skew effect which can typically occur with CMOS sensors due to the time difference between the first and last pixels being read. As the read time from CMOS sensors is increasing (shorter read times) this is becoming less of an issue in some cases. Mechanical shutters do require additional space, there are no space advantages to them. As for dust protection there is some theoretical advantage to them but in practice (at least in my experience) I have seen dust penetration in all cameras, there is a fundamental limit to what can be done to prevent dust penetration. cant wait for this to some out! me too.......and now there is no down thumbs for vote.....!!! EOS will have more MP than 41. who know. Well at least Nokia is trying out something new, thats not incresing display size, megapixels, or cores. trying something news? what new? That's not new!Camera on my Nokia N73 looks very similar. You might want to think about getting your eyes checked before getting a new camera. in marketing, bigger numbers looks better. With respect, you are missing the point. The 41mp sensor allows for "lossless zoom" - so, without a mechanical zoom, you can zoom in with no appreciable loss of picture quality. Other cameraphones with digital zoom cannot do this. Secondly, if you just want photos of, say, 5 or 8mp then the camera uses the extra pixels at its disposal to make the photo more accurate by combining them (excuse the non-technical speak!!). Finally, assuming it's the same sensor as on the 808 Symbian, it is a MUCH larger sensor than on any other cameraphone. @FlushGordon.. please read something about pureview and EOS.. don't be a dumb. You said you are a professional photographer yet you didn't read about this Cameraphones... Sick!!! I want to thumb you down but i can't do it..
You have 32 million of high quality pixels. The 41mp in the phone are used to deliver 5-8mp of quality image ;) Nokia suggest that people should not use the "full resolution photos" and shoot at the default "PureView" mode which delivers lower resolution (5, 3 or 8mp for the 808 PureView). And you call yourself a wedding photographer? You have no knowledge how the 808 uses its 41mp! Plus higher than 18mp overkill? why? because android doesn't have it? don't see people say 1080p screens and quad/octa core processors is overkill! but in this case Nokia ACTUALLY USES THE 41MP! Well, there's the Pureview modes that do superpixels.. The lower the output resolution (full 38 MP to 3, 5, 8 MP), the better the details. Only pros and post-processing require full-res captures I think. If my sensor had 41mp I would use it for every single shot (even for a 4mp snap ) because *not* using all 41mp means it's not capturing all of the available light and ~information~ of the image. So, your point about how often a 41mp *final* resolution is rarely needed is totally valid, but it doesn't discount the need for a 41mp sensor for every shot -- so really the follow on question is "why is a 41mp sensor useful for a low-res final shot?". I don't actually know much about pureview, but in general the answer lies in the benefit of --oversampling-followed-by-interpolation-and -downsampling-- which are staples of --discrete-(e.g. pixel)-signal-processing--. I probably wouldn't do a very good job explaining it, so I would encourage you to search around. But imagine two diagonal pixels of a 4mp sensor, each resolving to a color, now imagine chopping each of those into 9x9 sub-pixels of a 41mp sensor (each with it's own resolved color). Then you can create a better final 4mp shot from the 41mp pixels by averaging them to get to the final values for the two diagonal pixels of the 4mp image (this is called "interpolation"). There is another advantage of oversampling in that it can mitigate an effect called "aliasing", which is more difficult to describe without images/drawings. There are actually many other cool signal processing tricks (e.g. ultra-pixels) which are difficult to explain but offer advantages and tradeoffs, and so instead of getting caught up in marketing hype it is better to evaluate the tech by comparing final images of a controlled test, right? Ahh, Nokia, they're so smart! Hats off to Mr. Damian Dinning. He knows his stuff. Hope he goes back to Nokia...perhaps in better times.